In the time since Photoshop CS4 shipped, we’ve heard from some customers about various things not working as designed. In particular, various Windows XP configurations can exhibit slowdowns. A number of problems can be traced back to problems with video card drivers, but there are changes that Photoshop needs to make to improve the situation, and we’re working on an update that’ll be released soon. created a small pre-release program that we’re opening to public volunteers. like to help us test a potential fix, please email me @ adam dot jerugim at adobe dot com. as possible to deliver a solution. I’m sorry we weren’t able to catch and fix all the issues that people have encountered. If you’ve experienced problems and have some time to help bang on the fixes, we’d greatly appreciate your help. I definitely am a CS4 user and am experiencing major slowdowns, mainly on linux. You’d think it doesn’t even run at all! I gotta ask: is the fix called “CS5”? I recently changed to CS4. My problem is that under CS4 and OS X 10.5 images open only on the main screen (laptop monitor with palettes) and not on my second (calibrated) screen as I’m been used to working with CS2. I had to close the palettes, move the picture to my second screen, open the palettes again. A severe flaw in my workflow. I’m on Vista Home, double screen. Sometimes, some windows doesn’t want to pass from one screen to the other and stay in the middle, between the two screens. It has happened 4 or 5 times since I’m using it. I got bad performance on CS4 on my Windows XP, Even though I got a Q6600 with 4 GB of ram + Nvidia 9800GT (1 GB) on a freshly installed hard drive. Photoshop CS3 was much faster on my computer. I hope this update will make it right. I have to say Kudos to the Photoshop team. You all deserve a promotion for being pro-active with updates, fixes, and generally just responding to your customers. I have been trying to get something out of the Flash team for a long time, and they all ignore me. In fact I’ve written an open letter to Adobe about it. You can read it either on the support forums (http://www.adobe.com/cfusion/webforums/forum/messageview.cfm?forumid=15&catid=194&threadid=1418933&enterthread=y) or on my own blog (http://codinandboatin.blogspot.com/2009/01/open-letter-to-adobe.html). If you know anyone on the flash team that would be willing do read that, and proceed to do something about it, I would greatly appreciate it if you would pass it on to them. Since you’re fixing CS4 to address Photoshop issues, will you also be doing anything to improve the awful documentation? I don’t have CS4, but I’ve been using the InDesign demo and find the help tools to be so confusing I avoid them and won’t be upgrading my CS3 because of it. Half of the searches I do return results that, when I visit the site, don’t have any information unless I’m willing to buy a book about ID. Who thought up this torment for users? Do you know if the update will have a different BridgeTalk appSpecifier? We already have to deal with ‘Photoshop-11’, ‘Photoshop-11.032’, and ‘Photoshop-11.064’ depending on the OS and CPU running. I got pretty big slowdowns on my windows computer too – I don’t know really or my computer is too old..or Photoshop’s fault. However cs3 goes excellent. It’d be swell if you guys could take care of the save for web keyboard shortcut bug (on the mac at least)…if you modify it, you get a dialog about “Erasing Save for Web Preferences” that will never…go…away…. Just about everything else is gravy – great job! I would be willing to beta test the solution. I have Win xp pro sp3. Have a Radeon 4800 with 1gb Ram onboard and my system is Dual 2211 AMD with 4 gb Ram. PSCS4ext runs swell in 3D in any but slower in 2D than CS3 ext.Also, issues with windows dragging slowly,screen refresh issues and a crazy offset to PS font in titles and GUI. Otherwise, I love it.Count me in. Running Vista Business with CS4 on a laptop with dual screen. OpenGL works fine with one excpetion. The second screen seems to completely ignore the calibration profile. If I turn OpenGL off, the colors are correct. Primary screen (laptop) is fine. Otherwise CS4 has run just fine. Any chance this has been seen by development ? 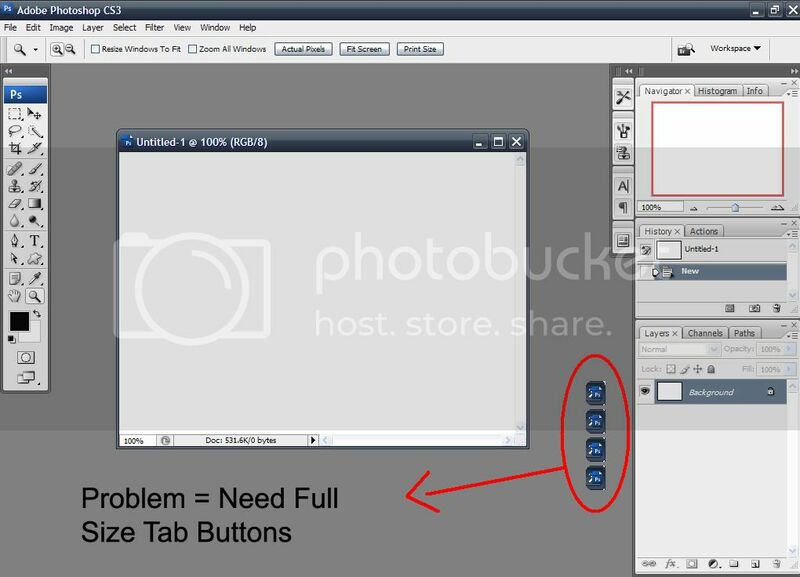 My problem with CS4 is after I open the program, if I click on the file tab to open an image, most of the options are grayed out except open recent and some of the others, like automate & scripts. If I click on scripts & image processor and then cancel that out, and go back to file, I can then open an image because its not grayed out any more. It does this about 75% of the time and the other times it will open okay. Got my copy of PS CS4 as a post-announce upgrade. Got the hardware to run it on . . . oh, wait, that’s going to happen in the alternate universe in which I have money. Too bad there’s not an alternate universe in which I actually can use the dang software without spending extra money. Was the exclusion of non-Intel systems really necessary, given that the other CS4 apps (with the exception of AE) don’t leave those of us without pots of money out in the cold? Particularly in this wretched economy? The video card feature keeps turning off, not all the time, but some. I cannot open jpg files with Photoshop from WinXP folders. Only in Bridge. and after a couple hours in Photoshop, I have to shut down and reboot because some plugins won’t work right. What “exclusion of non-Intel systems” are you talking about? And where did you hear that? Photoshop CS4 supports Mac PPC and x86, and any Windows x86 processor. Could you please please please – fix the dragging of layers. If you are in the default (tabbed view) of windows, you cannot drag layers from one doc over the tab of another to transfer those layers. Make sure the Adjustment Panel becomes an option, so we can go back to work. This is great news. My computer is more than fast enough, I upgraded my video card to an ‘Adobe Approved’ card, and am constantly checking for new drivers, but still, the lag while painting is annoying. CS3 was much smoother. On occasion, I will also get a glitch where the brush will only go in straight lines (no, the Shift or Caps Lock key is not pressed), and I’ll have to restart PS to clear the issue. Thank you for the promise of an update, otherwise I’m close to going back to CS3. It’s a simple one…a close button on the hard/soft-brush sizing window? Seems odd that I have to click outside the window just to close it. One issue that I’ve seen on my 2006 MacBook Pro is PS CS4 forgetting that the GPU is acceptable. So sometimes it works great and other times I have to quit PS and close other Finder windows and apps, and restart PS for it to remember that it can use the GPU like its supposed to. And I’m not sold on the tabbed document approach (as opposed to separate windows). I’d definitely keep that optional for the near future. There is a major bug in file saving for OS X in CS4 – Photoshop will wipe out all ‘extended attributes’ on any file it edits. These extended attributes (xattr) are supposed to hold data like kMDItemWhereFroms and other user settable data on a file. When a file is edited and saved, the OS is designed to keep the xattr around. But Photoshop uses its own intermediate file (which is fine) during saving, but then it does not bother to copy over all xattr from the old file to the new file – a real problem. xattrs can hold ‘real’ data – there are some apple security items often set, plus third party applications can set data on the xattr of a file. The fix should be quite simple. Erasing data out from underneath people is a definite no – no. That would be my G4. It’ll run AI but not PS. And this ain’t looking like a buy-new-hardware year. Very happy with CS4 master collection since 11/08 on Dell M6300 dual core, 8GB RAM Vista x64. Please upgrade or adjust your system to meet these requirements. OK. Why do I get this. I reinstalled and loaded already 5 times Vista x64 5 times, dowloade all drivers and most recent bios from dell. yet CS4 thinks that there is no x64 OS. 1) the painting cursors’ normal brush tip (an outlined circle so i can see what i’m doing) only shows the top left quadrant of the outline. useless. 2) handy Ctrl+double click in gray area openning a new doc (usually the size of what’s on the clipboard) is missing! why?! now i have to move my right hand off the mouse all the way over the the “n” key. too much. 3) empty selections that go outside the art are are confined to that area… so a large circle selection that needs to be adjusted gets cut off once moved. no good. 4) i’m sure there are more but i only got it yesterday. yay! My installation of PSCS4 (XP Pro, SP3, 4GB Ram, video card to old for GPU behaviors) has minor quirks (like telling me it can’t save a document because it’s open; not responding to function key shortcuts consistently, telling me an action is running when it isn’t–but I can live with those). The marquee selection tool is a little too powerful and is a bit more annoying. If I try to drag a selection from upper left towards lower right, the entire image floats or jumps to the left and beyond view. Bridge is a bit more difficult to live with. In “Essentials” view, the upper left (favorites, folders) and the upper right (preview) palettes are erratic. Previews may display on either, both, or neither. Sometimes I see straight through to the desktop where the preview panel should be. Sometimes the favorites panel is solid gray in its entirety or in sections and clicking on the gray brings parts of it back. If I move the mouse from bottom to top on the gray, it performs a curtain-like revelation of some of the favorite locations on the bottom of the list. Sometimes everything works as is should for days or for hours. All other panels (palettes?) work fine. All menu items work fine. i was looking into getting a new, more powerful vidcard when i found a silly article talking about a $2000 card that was designed specifically for cs4. haha. anyway, i turned on GPU, updated my drivers from NVidia, and there was some appreciable improvement – esp. with zooming and panning, it actually moves so smoothly that it’s like the image is on a giant airhockey table… kinda cool – but dragging a heavy file by the window is still almost impossible.. i’m def splurging for a new card to push things along. any word on the aps update? the right-click on the image document tab where i could quickly get to image size, canvas size, etc. why remove that? it was nice. hi where i can download the small program that you say? the problem i have encountered is this: when i use the hand or cropping tools the image/canvas leaps to the upper left corner and stays there. no getting it back with any tools – have to use “fit to screen” or whatever which puts it back in place but as soon as i go to work with the image it scitters off the screen. it can be corrected temporarily by discarding the preferences file and starting over but that only lasts a short time and then i am forced to do it again. extremely frustrating!! CS4 runs sluggishly all the time and sometimes shuts down when two Nikon RAW files are opened on my Windows XP Media Center Edition SR3 Pentium D 3GHz-based system with 2GB of RAM. My four year old Toshiba laptop with 2GB RAM can’t handle it at all. It runs best on my Vista-64 based HP system with 5GB RAM. As a basepoint measure, CS2 ran just fine on all of these systems. So does Photoshop Elements 7. My main problem – using a NVIDIA graphic display – is that the brush cursors disappear and fragments making it almost useless. I am really interested in any kind of update help here. I SECOND THIS MOTION, please bring this back! I just moved up to CS4 from Elements. I cannot get decent prints – they are dark and muddy. I cannot find print preview. Someone sent me a possible solution if I could find it. When is adobe going to fix Photoshop CS4 and make it stable! I’m running OS X 10.5.6 on a quad 2.8 with 16 gb of ram. Photoshop is super slow and crashes when trying to crop and image with only one image open. I’ve clean installed my creative suite more than once and am getting frustrated with adobe as many of the bugs with CS3 were never fixed before they moved on to CS4. I hoped that upgrading would have fixed the stability issue but CS3 was better which isn’t saying much. nVidia 9800 GTX, Windows XP Pro,2gb RAM, Intel Core Duo. 2 Bridge displays the same folder each time at startup instead of the last folder used like CS3. 3 Cursor on brush and clone breaks up as it get larger – terrible problem. 6. Load last document doesn’t load last document. Until now, since version 6 I have looked forward to and enjoyed each upgrade. This has been a horror!!!! I frequently work with multiple documents and find the MDI interface in CS4 quite irritating. The layout dropdown has no shortcut keys, and turning tabs off in preferences causes child windows to expand full-screen on top of the PS interface, rather than filling the parent interface. I’m more than willing to help. I have a Windows Vista 64 bit machine, with a NIVIDA GTX295 GPU, and Photoshop CS4 Extended will not recognize the video card as OpenGL eligible. I would be more than willing to test an update for you! How can I exit Adobe Photoshop CS4. I was working on different windows and now on my lower part of the screen and I can’t close. I had try everything even I can’t even uninstall the program I should do. HELP. I have 3 layers open. I cannot erase from the top layer to the 2nd layer. It only erases to the bottom layer. Why? I did this all the time in CS3. Is there something I’m not doing right in CS4? I’m an illustrator painting daily in Photoshop. LOVE the new open GL features (rotate canvas – smooth lines at any %)! My painting is rendered useless on any hi-res canvas (brush lag). ANY info is appreciated. If testing would be helpful I’d be willing . .
I’m running Windows Vista Ultimate, Core2 Quad 2.40Ghz, got the latest NVIDIA update and tried with OpenGL and without. PS CS4 is just slow. It lags to paint, move, and just about everything. I hope this update come quick. I just moved from cs3 two weeks ago and feeling bad. I had the problem of the cursor breaking up and becoming useless as it got bigger. CS4 prompted me to update my NVIDIA driver. The new driver is dated mid-January 2009. I am a photographer, and not a technician, and I managed to make the fix and it worked. CS4 still gives me no-can-do/out-of-memory messages that CS3 did not (XP Professional SP3, 3g RAM, Intel Core Duo in the box and on the NVIDIA card). I’m still able to save, so I save what I’m doing, close Photoshop and reopen it and all goes well. I’ll watch for fixes. In any described situation, Windows XP close Photoshop and user lost your file (yes, lost all your work). Inside of details, the module with problems is adobeolw.dll. Scene: Windows XP and Photoshop CS4 (part of Web Collection CS4). Not occur with Windows Vista. Found you some problem similar? The update in development solve this problem? What happened to right click and copy to copy the file? I can’t copy anything now. I can’t imagine what you did with it and why—it was so fast, easy and compared to this a major time saver. How do you copy an image now? I always work on a copy to leave the original alone, but now it’s insane. I am really bummed about CS4 and 11.01 has just been too long in coming. CS4 is the first PS I have purchased since PS7, which I was (and still am) very happy with. I was really looking forward to the 3d functionality and most especially the canvasrotate feature, which would probably be great for tablet users like myself…. I really can’t comment on wether it is as useful as one would hope however, because CS4 is completely unusable for anything to me. My PC is way above the req’s. I am frustrated because 750$ is a lot of money to me. I thought I was buying something that I would be using for years (which was andcontinues to be the case with PS7), but I have ended up with something I can’t use at all. It was sitting in my quick launch for months causing problems with shortcuts, as the “Edit With” from the context menu, and double clicking on a .psd would often default to CS4 despite the fact that I pointed to PS7 in the “Open With” menu. Basically, I feel like I shelled out 750$ for nothing. If in fact this 11.01 update does fix the problems with CS4, i have to wonder how long it will be before CS5 is released…….. I gues it really doesn’t matter, the joy and the shiny-newness is already gone. Adobe if you want to make people happy.. give anyone who bought the tragic CS4 some BIG (much bigger than the normal upgradde discount) discounts when CS5 rolls out. CS4 though may mean the end of me using Photoshop and moving over to lesser luxurious but certainly faster alternatives. I would hate to lose Flash for the same reason, not all users run mega Macs! In one client side peice of work I too had to resort to using Gimp for a temporary install where normally I would have evangenlised to the client to buy a Photoshop licence after the project was finished. Not cool. Not cool at all for Adobe or us designers. Come on guys, quit shooting yourselves in the foot! You deserve so much respect for the past few years, what has happened? No matter how many times I disable the friggin’ “Open Documents as Tabs”, option, every time I open a file it opens up as (yes, you guessed!) a tab. I’d say that, based on all the performance and flaws this rushed version of Photoshop has (seriously, it behaves like a late alpha, not even a beta) you guys really screwed up this time by not having a public beta-testing program like the one you had with CS3 –that version was, from the beginning, one of the most stable in Adobe’s history. I upgraded my machine (to Core2Quad, 4Gb RAM, Nvidia 9500) so that I could use all the blows and whistles of CS4, yet so far this version of Photoshop performs much slowly and unreliably than CS3 did in my four-year-old Pentium IV computer. I think this is a disgrace from Adobe’s part, period. I think I made a mistake and wasted money on the upgrade to Photoshop 11. Am going to deactivate CS3 on my other machine and install it on this one. CS4 is a joke. A bad one. I downloaded and installed the new patch this morning. So far so good in bug extermination. Hopefully all the vermin has been chased form CS4. I do appreciated the personal contact from Adobe. update fixed it! like freakin butter now. thanks! I was quite suprised that photoshop cs4 ran waaaay too slow on my laptop (c2d @ 2,24GHz, 4GB ram, nVidia Quadro), getting even worse performance with openGL enabled. The performance was just pretty bad. The new updated speeded up whole program like 10x – thank you so much!!!! However I still observe some issues with openGL when using brushes – the brush follows the cursor with a little delay. Without openGL support everything seems to work just fine. Also no speed up in 3D layers with openGL turned on is noticable. I have the same tab issue problem it just wont stop to open it as a tab no matter if the box is checked or not its driving me crazy. The cursor problem has NOT been solved for my NVDIA GeForce 9300M GS. I have made a complete re-installation of XP, installe CS4 and updated. Useless! When – and how – will this be solved? I have downloaded a newer NVIDIA driver, but it’s a Lenovo laptop, and you cannot install it from NVIDIA’s site. You have to wait for Lenovo to sort of release a newer driver. I can’t say who’s to solve what, bu what is true is, that I find lots of people on the Internet complaining about this issue. Have been having trouble with brushes- can go for a bit, no troubles then they have a mind of their own. I will draw a line and it may not show up, then I draw again and it will be completely off from where I drew the line. ?? Also so issues with skew, seems really sensitive flipping things irratically. Pretty bummed out with these issues- please advise. I have a problem with CS4 and am looking for any input. I have a Radeon 4870 graphics card with dual monitors. On my Samsung 215TW Syncmaster, if I turn “Enable OpenGL Drawing” ON, when I move images around the screen (just drag and drop to another location in the same monitor), the image goes blank. But if I make the image window larger, the image re-appears. Has anyone else heard anyhting about this? Am running XP Home, SP3, quadcore asus, 4gb RAM, radeon 4870 1gb mem. I’ve got a random question, hoping you can help. For rotating the canvas, you have two directions to rotate in, CW and CCW. In the Spanish version (CS2 at least), there are also two options, AC and ACD. And there is nobody, but nobody that can figure out what those letters mean. There’s entire forums on it. Finding which is which is a trivial issue, but the question is: what do those letters stand for? If you have a contact in a Spanish-speaking office, I’d be happy to translate and pose the same question. My photoshop CS4 is causing very very dark prints that are blocked up. What is going on? When I print in CS3, they look perfect. Now I have to run 2 different versions of photoshop. Please, can somebody tell me about this? No good, indeed. This (and other “inventions”) makes Photoshop CS4 unusable for me. The worst pro software i have ever had. When working in 3D Mode, the 3D Axis which helps you to control your 3D transformations randomely disappear. No way to get it back then to restart Photoshop. I’m back to Photoshop CS3 now. The next “upgrade” i will buy might be CS6 or so. I am using PS CS4 11.0.1, but the problem documented below also existed before I upgraded to the .1 version. In many different situations PS is reluctant to update a layer icon or an entire image window after basically any operation. For example, if I use the rectangular marquee tool on an image, and release the mouse after drawing the marquee, the marching ants don’t show until I click with the move tool somewhere in the image. When I highlight the layer the image is on, and hit backspace (Windows XT), the selection is not removed, and the marching ants remain. So far, the only way I’ve found to refresh the screen, showing the selection deleted, is to double-click the layer icon, which incidentally brings up the Blending Options dialog, the selected deletion finally shows (updates), and then I exit the dialog without any action. The lasso selection tool behaves the same way. There are other mysterious occasions when an action like a clipping mask will refuse to display in the layer mask icon (only transparency is shown, not the black and white mask) and other such freaks of nature. I’m finding workarounds for these anomalies, but they continue to interfere with workflow. See the Adobe user forums for more details, but updating the video card driver usually solves that problem. Incomplete brush cursors were a common problem with older NVidia video card drivers. Updating the driver should fix it. And make sure you pick up the Photoshop 11.0.1 update, and update any third party plugins you may have installed (some have had serious problems that affected the main application). I’m using a MacPro with 10.5.8 as well as a MacBookPro. When I try to run AutoStack Panorama/HDR I get a “images missing preview data” and this repeats on and on. Sometimes Bridge crashes, sometimes it just stops running the command. No stacked images are created. It doesnt matter if I run CR2, DNG or JPG images. What can be done? I am not nearly as advanced as some of the users here, my issues don’t require me to do anything before they p*ss me off. Vista Dual booted with XP. CS4 Web Premium loaded on the XP partition. Every time I open Ps (extended) I get the message to go to the URL and update video acceleration drivers etc. At first I ignored it, but every time I open a photo or a graphic in the Ps canvas I can only see part of it, like it has been divided into squares or rectangles, one square will be visible while the others are hidden, and it will just keep alternating one square after the other, but never is the entire photo visible. It’s very frustrating and just plain WEIRD! Each rectangle is about 1/4 or 1/6 of the area of the original imported photo. So I followed the prompt, went to the Nvidia site and downloaded the latest drivers, installed , after adjustments, I could notice a slight improvement in the appearance of my desktop icons, web pages, etc. So, back to Pshop, opened it up and even though I JUST updated the drivers, I still get this annoying message prompt… and that crazy mosaic break-up of anything you put on canvas is still happening. I’m at a loss. Lucky I found this forum but don’t even know if I’ll get a solution here. Thanks for any advice I can get. I followed your link to the “update” page, but 11.01 is the version I’m already using, updater won’t install because it says I have it already. I’ve only had CS4 for a couple of months, but I’ve had a chance to play around with Ai, Fw, and Fl, and this checkerboard preview image breakup doesn’t happen with them, only in Ps. Still lost. I have a huge problem, I currently have Photoshop CS4 on my PC and I am using it for school. My last assignment is working in animation. Our professor wants us to use Extended but every time I load the trial of Extended it is still the version I already have. I need to know what can I do to get rid of the other Photoshop besides uninstalling it because I have already done that 5 time and put the Extended version on my PC. Is this a Vista issue? Please help I have finals soon and need to get this done. I’m having the same problem that Randy has. This is all of a sudden. My file seems to have been corrupted in some way and I am getting very odd breakup of the image ala “checkerboard” flashes. I don’t even know what to call this. I’ve seen something similar years ago that was related to a bad memory chip. Don’t know if that could be it. Also PS will sometimes just be unresponsive, tools won’t work, etc. and the only answer is to quit and restart. Any help out there? Sarah – deactivate your current copy, then Install the trial. When done with the trial, reactivate your normal copy using your serial number. Remember that uninstalling does not deactivate. Phil – most likely you’ve got a bad video card driver that you need to update. In the meantime, you can disable OpenGL drawing to avoid using the buggy parts of the video card driver. Yes, it could be RAM or the GPU, or the video RAM as well. But we’ve seen so many bad video card drivers that they’re much more likely to be the culprit. I purchased CS4 and for a week straight I have been working with techs from adobe(who have all been very nice) to try to install on my computer. I have a pretty new Dell with windows vista and most of the memory open. The only programs on my computer are my photography stuff. nothing harmful. I have clients waiting on me and at my last ends wits!!!!!!!!!!!!!!! I use PS4 on XP64, 8 gigs of RAM, about 60% allocated to PS4. I work in large files (24in x 18in at 200dpi with anywhere from 30-60 layers). I only use one undo/history state. Small layer icon previews. PS4 works great for everything I do except it doesn’t recycle the ram it uses. I can tell when it has used it all up as it slows down on everything it does. I then usually save, quit, reopen the file and am good to go again. I am tempted to upgrade to Windows 7 64bit to see if this solves the problem since I noted XP64 is not officially supported. But that is about it. Awesome program. If I can lick this problem I will be using this version for years on end. OS X 10.5.8, CS4. When using “Save for web and devices” dialog, it once in a while opens TWO “save optimized as” boxes, one above “Save for web” (as intended), and one below. After the exported image is saved, the “Save for web” dialog remains open, along with one inoperable (!) “save optimized as” window. Can’t cancel, saving again doesn’t work, can only force quit (and lose all my work). just doesnt work.When I hit enter, the text just exits the text entry/edit mode. You put zero in the leading field, and the text engine is doing what you told it to do…. Clear the leading field to get back to the auto leading value. And you’ll get help quicker on the Adobe user forums. Also, hitting ENTER is supposed to exit the text mode, as you have just committed your changes to the text. Pressing RETURN goes to the next line. I Added a screenshot too. He didn’t say it won’t go to the next line, he said it exits the edit mode all together. I’m having the same issue and my leading is set to auto. On the majority of PCs, the return key is labeled Enter, so this isn’t the issue either. I have similar problems with the combo of Windows 7 and Photoshop CS4. That is, very dark prints that in no way resemble what is on the screen. Further, crashes while printing, in particular when ask for preview of the print. Help! Was anyone able to suggest a cure for patty Carroll’s problem? I am very dissapointed in this system. My computer recently crashed because of it.I would advice new users to revise their options before choosing photoshop cs4. I have Photoshop CS4 and am using a Dell Precision M6300. I do a lot of graphics at work, the cropping feature takes forever and sometimes I end up with a blank picture instead of the cropped section. Photoshop cs4extended. When i click on a jpg file it opens in raw. I had to disable the ‘open jpg’ feature in raw prefs.Also some PFD files can’t be saved to jpg????? I’ve been running Windows 7 on my HP G60-443NR and Photoshop CS4 works wonders. Don’t know if I’m lucky or maybe it’s because Photoshop CS4 was newly installed. Either way, the latency has decreased compared to Vista SP2 32BIT and has increased my productivity. Great work Adobe! Can’t wait until CS5 comes out. Couple of things that have helped me is to use the recommended screen resolution for the type and size of your monitor/video card/laptop/or desktop PC. I have used CS 4 some time now but recently I noticed that my monitor obviously needs re-calibrating, I know that there is a professional program available from my camera club but the club is nowclosed until September. Surely there is a way I can do this within CS4 as I have done this with previous versions of Photoshop but I cannot find how to do this with CS4. At present I am housebound after having had a major operation for a Knee repacement so I would appeciate help as all my photographs are showing a distinctly pinky shade so I would say a re-calibration of my monitir is essential. System: 32-bit XP Pro SP3, Xeon E5520, 4 Gb RAM, Quadro FX 3800 1Gb, dual-screen setup. Case: I recently upgraded from 2 smaller screens to 1 smaller (23″ 1680×1050) and a larger (27″ 2560×1440) screen. Before this upgrade I had no problems with CS4. However, in order to feed the 27″ screen , the gfx card drivers needed an update, so i got the most recent drivers from Nvidia. Now I have the same issue as has been described above. When any brush contour size is set above a certain size, only the upper left quadrant is shown. The most quoted solution appears to be a graphics driver update. But since in my case the problem started after such an update, I wonder what’s up? as lo res but once it’s in PS it’s hi res. I have a pc Vista, PS cs4. Hi, i have some problem with running photoshop on ms 7 windows. Some days ago i want to turn on photoshop cs 4 trial and its showed me a communicat like photoshop is stopped working. i cant run my photoshop.